I'm heavy web user which requires a lot of tabs being opened during my everyday work (>=50-200 tabs). 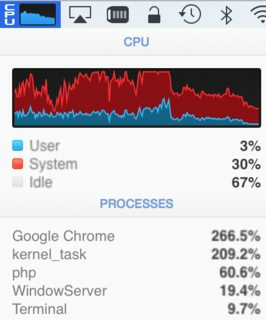 I'm using Google Chrome browser for couple of years and become very slow and an overkill for my operating system on everyday basis (OS X, El Capitan). I'm already using minimum amount of extensions, such as OneTab (for saving non-used tabs), Tab Dupectomy (to remove duplicates) and Adblock Plus (for blocking animated ads), blocking flash, and everything else to reduce the memory and CPU processing of multiple tabs. However still every often my system freezes because of Chrome, so I have to kill some background tabs which taking the most resources and freezing my system, but this is only the workaround. Most of the time closing or opening new tab is taking several seconds to complete. I've reported several bugs against Chrome, but it's pointless work (as most of the reports are without resolution for years) and it's just too heavy to use in general (as the feature list is growing) and it's just broken on so many levels. Note: I've 2.3GHz Intel Core i7 (4 cores) with 16GB of RAM with NVIDIA GeForce, so I don't think my hardware is the issue. Based on above, I'm forced to change my browser to achieve some better performance during heavy browsing. ability to disable background processing (for tabs not being in use). Budget: ideally free, but I'm consider to pay reasonable amount for the better quality. I came across the Brave browser which promises faster Web by banishing intrusive ads, stripping away everything but the real content. Up to a whopping 60% of page load time is caused by the underlying ad technology that loads into various places each time you hit a page on your favorite news site. And 20% of this is time spent on loading things that are trying to learn more about you. It has very minimalistic features with class leading speed, security and protection which gives users control over their personal data by blocking ad trackers and third party cookies. For example on mobile devices the web page load time speedups is massive (see: Brave Browser iOS Speed Test). The large amount of tabs can be organised by tab pages, where maximum tabs can be separated per each page. The desktop browser is a cross-platform desktop application with support for most of major operating systems created with a fork of Github's Electron framework that is itself based on Node.js and Chromium. You may compare the JS speed between the browsers using speed-battle browser test. I had better results in terms of overall score with Brave than with Chrome on Macbook Pro. It takes similar approach to Brave by blocking tracking scripts and ads which loads webpages as much as 25% faster than other browsers. Using turbo mode (HTTP only) speed up slow connections and load pages faster since Opera's servers identifies pieces of the page that can be compressed and sends back these smaller-sized pieces to your computer, reducing volume of data transferred by up to 80%. The web content your device receives to a fraction of its original size. You get all the videos, photos and text that you normally would, but you eat up less data and load pages faster. Superior Speed Users can enjoy faster speed in loading webpage and running applications. Midori is blazing fast, utilizing the latest web technologies and a small, but dexterous array of extensions provide all the essential features. On the other hand, Chrome could be not so bad, if properly tweaked. 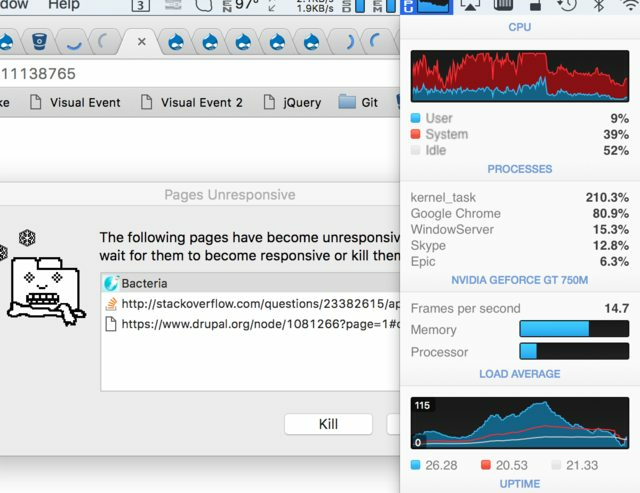 See this for further details: Chrome addon to stop "Page(s) Unresponsive" message. Not the answer you're looking for? Browse other questions tagged osx web-browser or ask your own question. Is there a browser which supports isolating tabs?